Gosh, it's been a long time. I think that's the longest I've gone without an update. Is the quest over? Nope, not by a long shot, but I've been absolutely swamped with work and not had time to play anything. I finally got over the hump of it a week or so ago and my evenings and lunchtimes are my own again, though I'm still busy. Anyway, it's given me a chance to get back into DOOM in earnest, and I finally finished it over lunch today. I've already mentioned the graphics, which were indeed beautiful (if blood and demons can be called beautiful) - easily the best of any game I've played on this list, but as I've also already mentioned, the game itself didn't grab me as much as I'd hoped. Don't get me wrong, it's not a bad game by any means, but it's different to the usual Doom canon. The prerequisites of lots of monsters and lots of shooting are all present and correct, but this has morphed from a corridor shooter into an arena shooter. It feels much more akin to Unreal Tournament, or similar - something where it's all about 3-dimensional movement around the environment and agile attacks coming from all sides. That sounds like it should be a good thing, and perhaps to some people it is, but it just doesn't feel like Doom to me. This game is all about moment-to-moment gaming, a series of fighting arenas joined by corridors with nothing really in-between. There's not really any sense of progress or exploration. 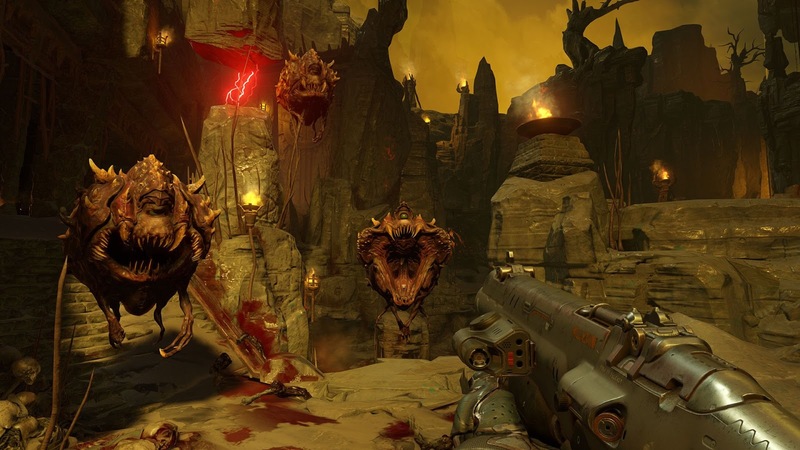 Doom, to me, was always a nervous game - creeping along dark passageways wary of anything jumping out at you. There's none of that here, you will very rarely find any 'wandering monsters'. Pretty much everything you fight will be within an arena, and the monsters will just keep respawning until you've reached a set number and then they'll stop. And once they've stopped, that's it, the arena's clear and they don't come back. That's when you get to wander around the arena picking up ammo and looking for secrets, but it's absolutely silent and free of any danger. The arenas are generally sealed affairs, too. They don't want you escaping the fight, but this really limits the tactics - no kiting here, no retreating, no seeking tactical advantage or sniping, it's all-or-nothing in-your-face action. That's fine sometimes, but it gets monotonous really quickly. I know that's what they wanted, to strip it back to the visceral guts of Doom, nothing but you, a bunch of demons and a boomstick, but in doing so they removed something essential, they removed the fear. You're no longer scared of what's around the corner because you know there'll be nothing around the corner - the fights are all so telegraphed that you know exactly where they all are. Those fights are beautiful and thrilling, but that's all they are, and for me it's not enough. I miss exploring a dark map. I miss stepping on a switch and having a pinky teleport in behind me. I miss hearing the howls of demons somewhere around me, but not knowing where they are or when they're going to leap out at me. It's a beautiful game; it's a thrilling game, but it's also an empty game. They cut off too much when they pared it down and for me, ultimately, it was a bit of a disappointment. I've also been playing on the PS3 with the kids on weekend mornings, and we've finally beaten Jak and Daxter. It was as good as I remembered it back on the PS2 (though the camera is a bit awkward). Now onto Jak II, the emo years.